Ever since the reunion of Pestilence I had the urge of following these guys from a distance. Their first effort after the reunion called Resurrection Macabre showed us a straight forward death metal record like their cult albums Consuming Impulse and Testimony Of The Ancient. It’s successor Doctrine had the focus much more on the Prog Fusion side of the band which to most fans was quite a stab in the back. Certainly since it was also one of the reason of the break up 22 years ago. Maybe you can state that this album could be their ‘Make it or brake it’ album. Within the first couple of tracks I find it very clear that they have searched for the ultimate mix of technical riffs combined with a brutal sound. Which resulted in a perfect mix of their previous two albums. Where Doctrine has a more fusion influences which sometimes led to an over compensating has Obsideo the right amount of technical riffs without getting lost in the woods. Although I’m pretty siked about the music in general the vocals do disappoint me a bit. One of the problems I always had with Patrick is that I miss a bit of insanity within his vocals. The growls and grunts just sound always the same without any form of emotion. Don’t get me wrong they are performed very well, but I do miss a little bit of unpredictability in his voice. The unpredictability that gives you the feeling that he pushed himself over the edge. On the other hand you could say that the vocals are submissive to the entire song and just adds a little bit instead of taking over the attention of the listener. Well in the end it’s pretty clear for me. 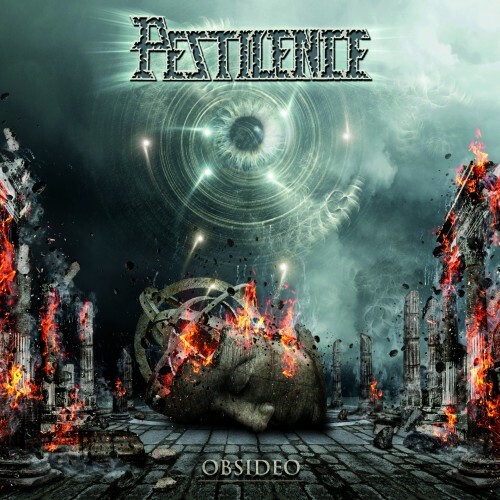 Pestilence did live up to the expectations of creating a well-balanced album that both features fusion elements, technical riffs but still had a brutal feel. You could almost ask yourself if these guys finally found the perfect mixture that kept them busy for so long. I certainly don’t mind if they deliver a couple more of these albums. It certainly lifts itself above the field death metal releases of the last year.